Greensboro, NC – Clemson freshmen Tony Stockman and Chris Hobbs have both been named to the ACC All-Rookie team for the 2000-01 season. This is the first time Clemson has had two players named to the ACC All-Rookie team in the same year. No Clemson player had made the team since 1996-97. Stockman and Hobbs were joined on the team by Chris Duhon of Duke, who was named ACC Rookie of the Year, Marvin Lewis of Georgia Tech and Michael Joiner of Florida State. “This is a subtle message that some catching up has been done at the base (freshman class) of our team,” said Head Coach Larry Shyatt. “I am happy for Tony and Chris to be named to this team. They certainly were important players in so many areas this year. Stockman led all Atlantic Coast Conference freshmen in scoring this year with a 12.0 average. In fact, he was the only ACC freshman to average in double figures. He is the first Clemson player to lead the ACC freshmen in scoring since the 1974-75 season (Skip Wise). He ranked second among ACC freshmen in assists and was first among the rookies in three-point goals. The native of Ohio scored 373 points for the season, second on the Clemson team and second best in school history among freshmen. 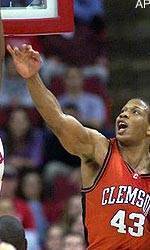 His 75 three-point goals set a Clemson freshman record and his .836 free throw percentage was third best. His 12.0 scoring average was second on the Clemson team behind second-team All-ACC guard Will Solomon. Hobbs, a native of Chapel Hill, NC, averaged 7.3 points and 6.3 rebounds per game. The rebound average ranks first among freshmen in the ACC this year. This is the first time Clemson has had the top freshman scorer and top freshman rebounder in the ACC in the same year. In fact, it is just the second time in ACC history that two different players from the same team led in each of those categories. Hobbs ranked first on the Tigers in rebounding, first in field goal percentage (.566) and fourth in scoring. He also shot .688 from the foul line. For the season, Hobbs had 190 total rebounds, fourth among freshmen in Clemson history. The only Clemson freshmen in history to record more are Tree Rollins, Sharone Wright and Dale Davis. All three of those player went on to become first-round NBA draft picks.